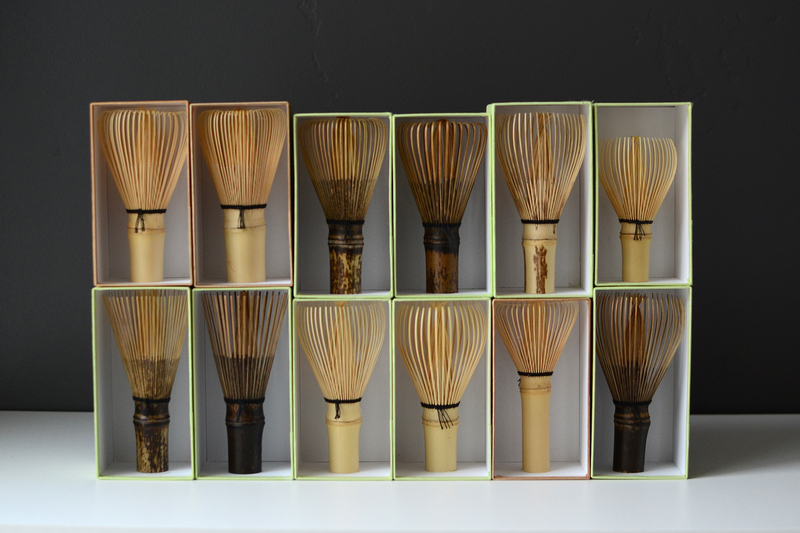 I took this photo this morning to show some of the different types of tea whisks that we received from Nara’s master tea whisk maker Tanimura Tango today. It is astonishing to see this photo and then to think that the utensil was originally devised 500 years ago, around the time that Michelangelo painted the Sistine Chapel ceiling, and that it has remained virtually unchanged since. 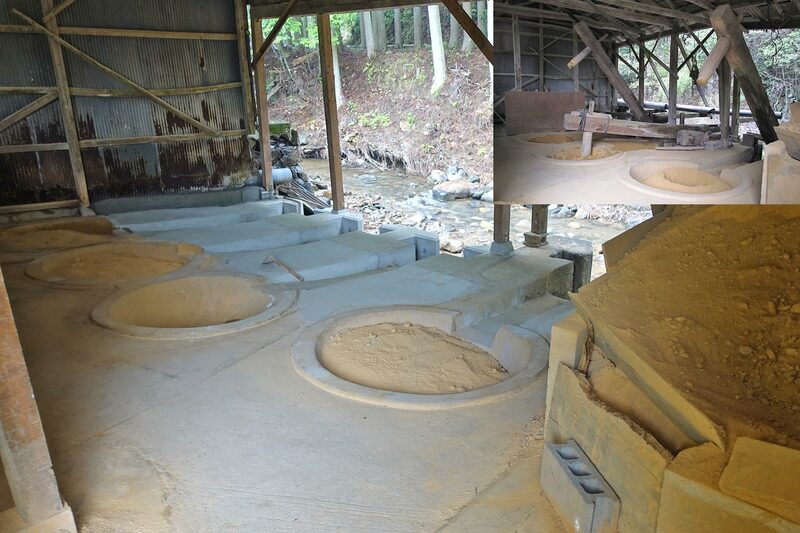 Iowa potter Shumpei Yamaki takes a very long time to load his single-chamber anagama kiln. “People used to mock me in school because I was so slow”, he chuckles. 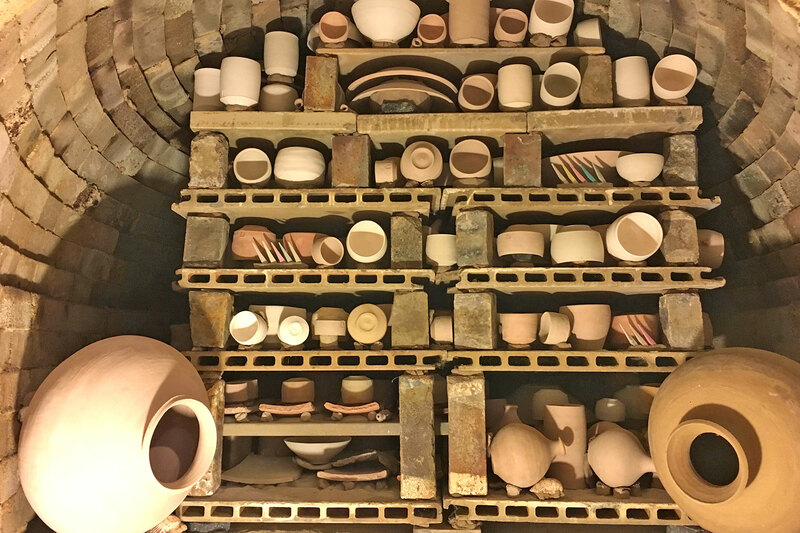 “But to me, kiln loading is like completing a beautiful 300-piece, three-dimensional jigsaw puzzle that has infinite picture variations”, Shumpei says in explaining why he takes about six times longer than other potters for the loading process. 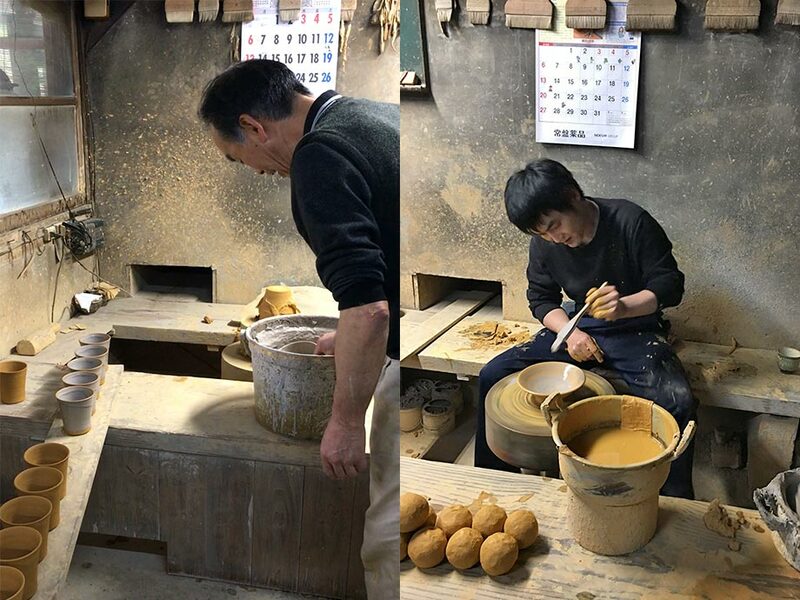 Unlike many potters that load similar sized items in groups inside the kiln, Shumpei arranges vessels of various sizes and shapes all mixed together. 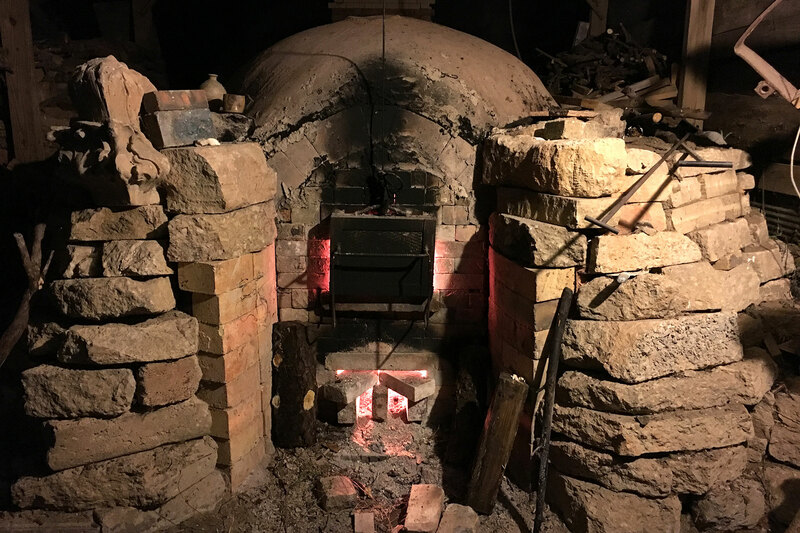 It takes much longer to load pieces this way, but to Shumpei the utmost advantage of firing unglazed wares in a wood-firing kiln is the freedom in the way the pieces can be arranged inside it. 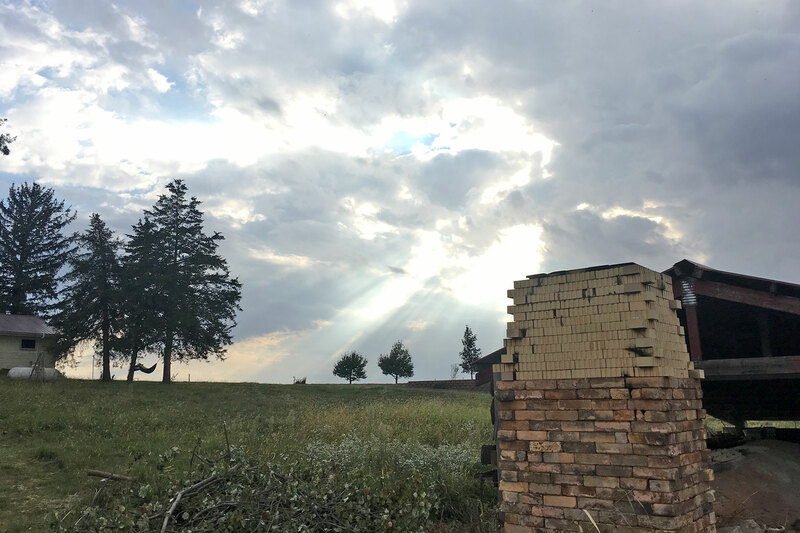 To place each piece, Shumpei considers how the fire will flow between the pieces and how the ashes may fall onto their surfaces: by stacking, putting the pieces on their sides, and placing them diagonally or upside-down. Shumpei takes his time because he simply does not want to ‘waste’ the space by lining up similar pieces. 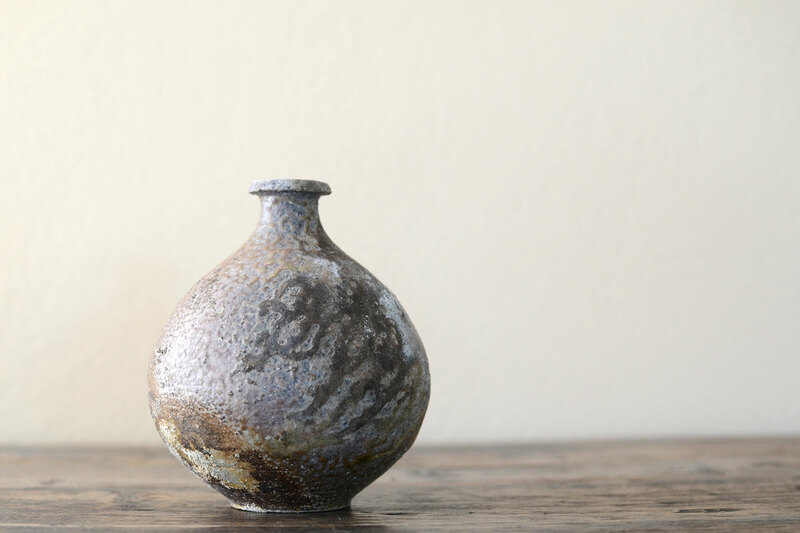 Wood-fired Jar by Shumpei Yamaki. This jar is an example of a piece dropped onto the embers in the firebox. 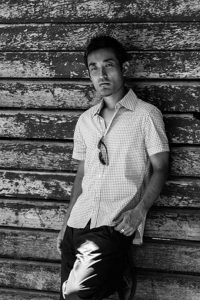 All of this attention to kiln loading and pottery making in general was implausible to Shumpei back in the late 1990s when he arrived in the U.S. to learn street and house dance. He then went on to study archaeology at the University of Wisconsin, but was still unsure if this topic was what he wanted to pursue as a career. Behind Shumpei’s move to the U.S., there were complex tales of brilliantly talented family members and self-imposed expectations in life as the eldest son, together with perhaps a desire to run away from it all. Traumatic as this accident may have been, Shumpei speaks openly about it because he realizes that if it was not for this event, the club-dancing, fashion-conscious young man would have never learned pottery that was recommended as physical therapy for his damaged arm. 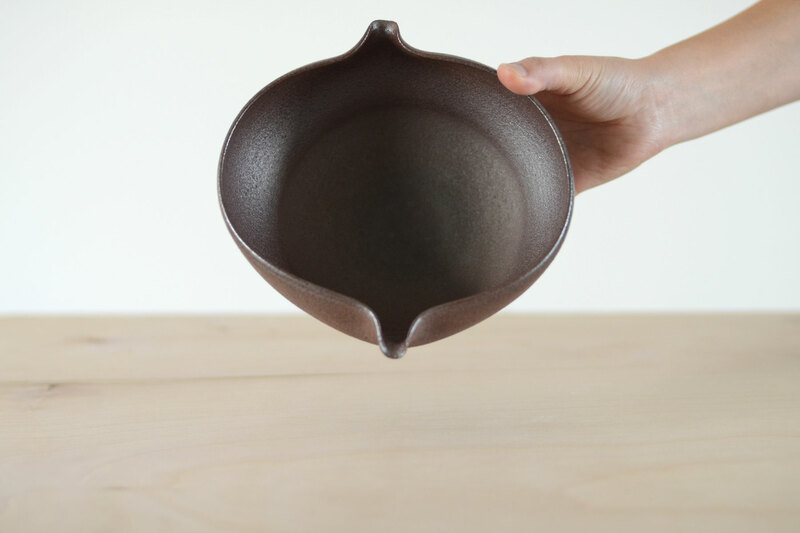 Shumpei’s natural gift was quickly recognized by Karen Terpstra, Professor of Art at the University of Wisconsin who recommended Shumpei to continue with his ceramics studies. He went on to apprentice under Richard Bresnahan of St. John’s Pottery at the College of St. Benedict and St. John’s University, and eventually received a MFA from the University of Iowa. 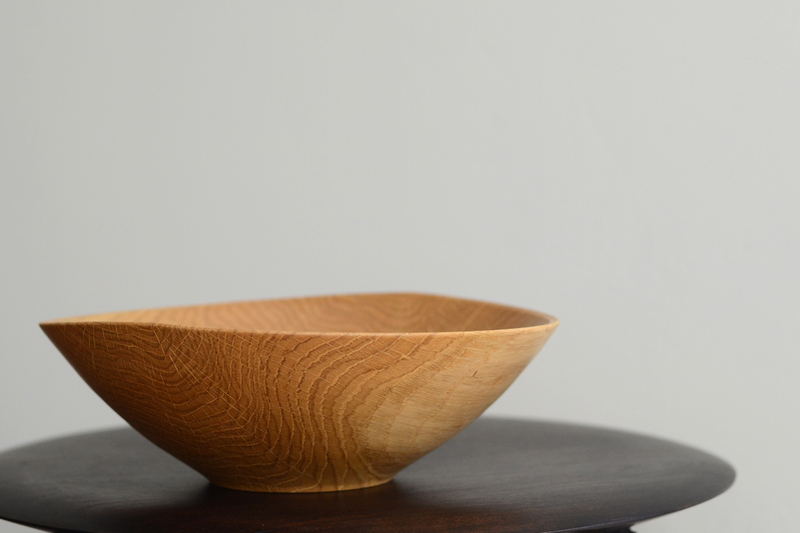 The hallmark of Shumpei’s works are their refreshingly modern and sharp lines, a welcome diversion from wood-fired works that often have a rustic and clunky image. Shumpei’s care to pull out the maximum effects of fire in the kiln are evident in every one of his pieces. 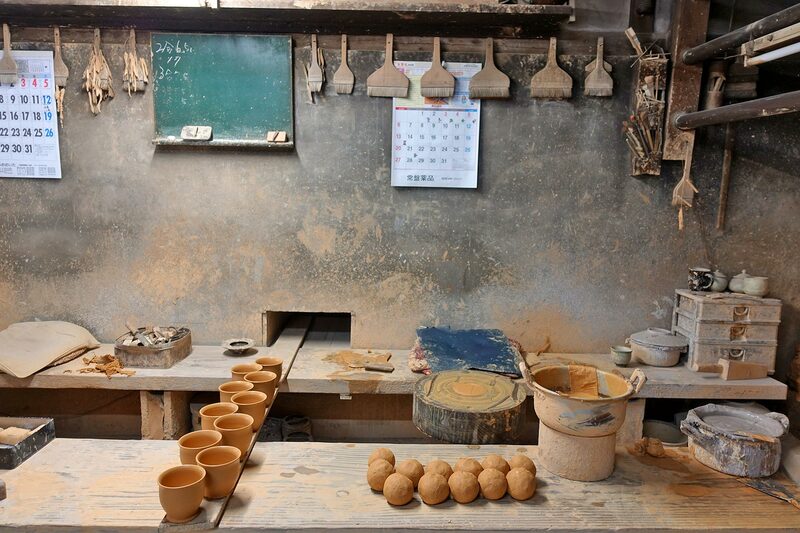 Shumpei takes time to make each piece of pottery with heart-felt sincerity. Until Shumpei started making ceramics, he assumed that he would end up living in the city, similar to where he grew up in Japan. After all, nature and earth were the furthest away from his interests. But now rural Iowa is his home, where all he can see around him is the horizon and his kiln. Shumpei contemplates the path that he has traveled. “I was sent to nature camps when I was growing up and I couldn’t adapt so I thought it wasn’t for me. 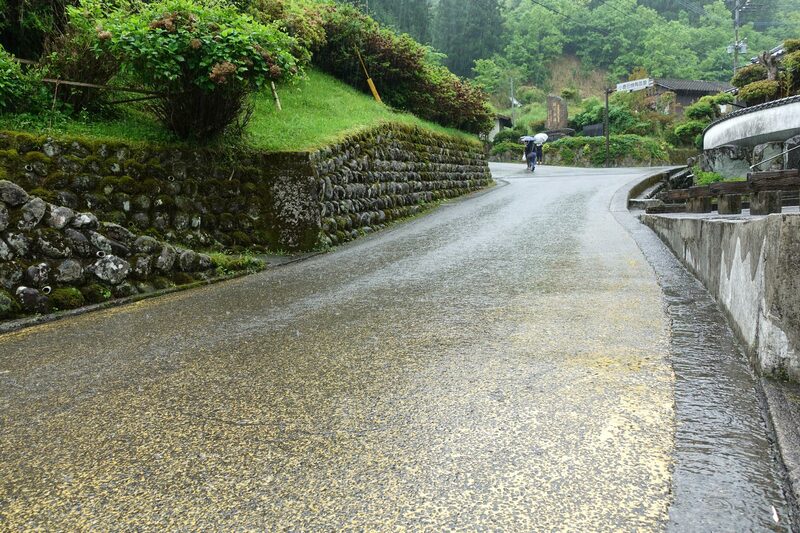 But now that I live here [in the countryside], I’m surprised how much I enjoy it”. 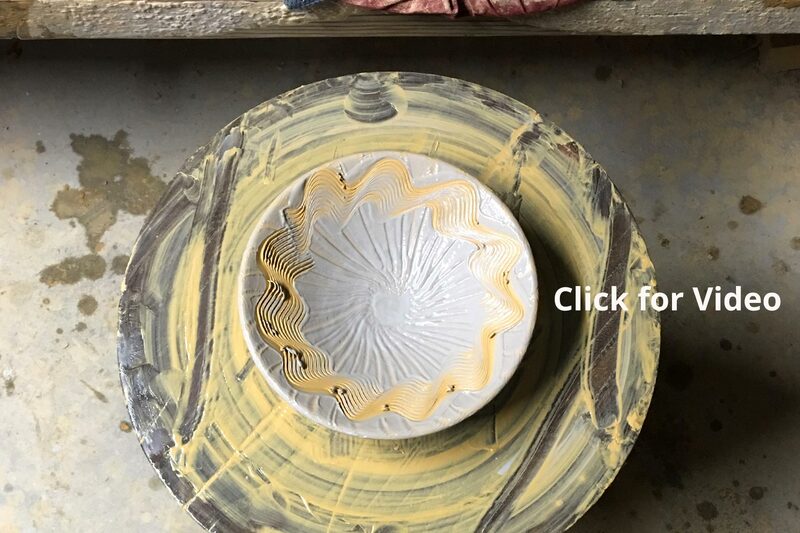 He is making elegant pots and also continuing to dance, and he’s so good at both because of his extraordinary ability to feel, improvise, and be free. How should I select and arrange flowers in a vessel? For the tea room, Japanese tea master Sen no Rikyu (1522-1591) famously said that “the flowers should be arranged as they are in the field”. 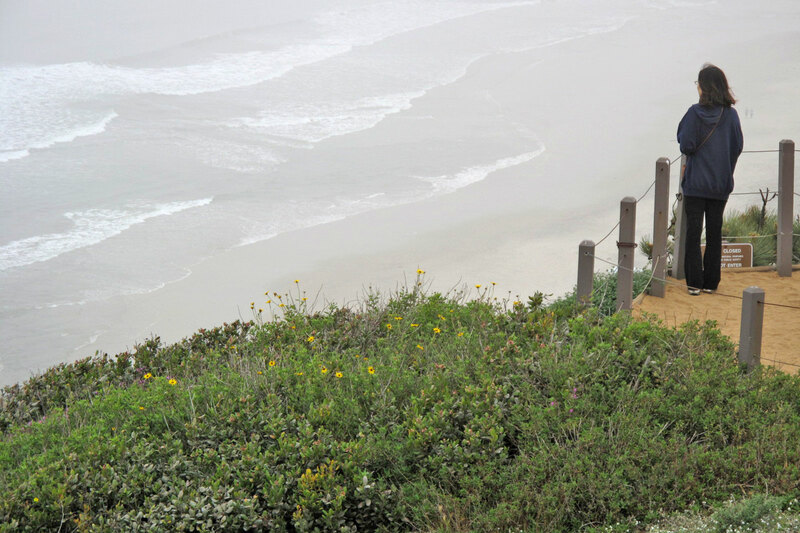 Looking out to the ocean from Torrey Pines State Natural Reserve. Natural reserves provide a glimpse of what indigenous California fields look like. The Southern California coast often starts gray in the morning, as seen in this photo, but then brightens as the sun breaks through for the rest of the day. On one side of our back garden, I have a long strip of planter area that I had been been watching weeds grow for the last two years. My grand plan after all the necessary repairs were done inside the house, was to plant some beautiful flowers like camellias and peonies that are listed as ‘appropriate’ for the tea room. No I don’t have such a room yet, but it is part of my ambitious 20-year renovation vision that I promise to discuss with my husband who will first read about the plan in this blog. I began researching camellias and read about the care and attention for the one type that I have always wanted. 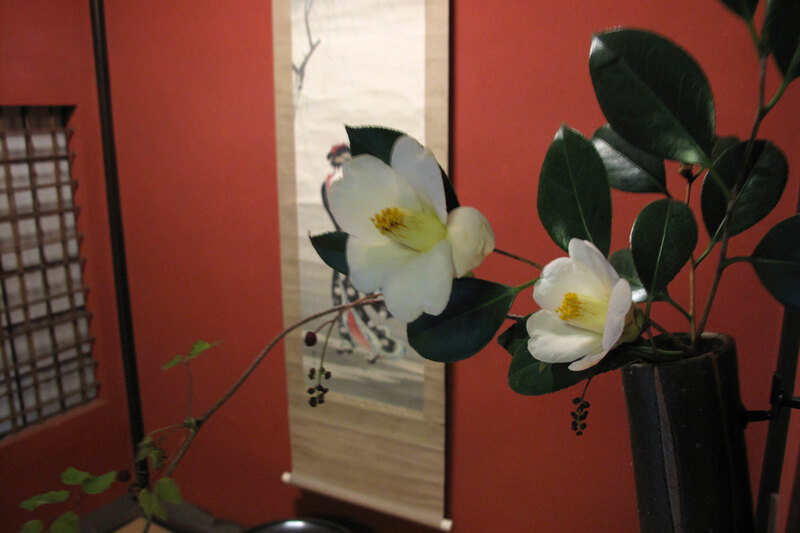 It is called Camellia Wabisuke and is a small single form camellia that I frequently see in photos of tea room alcoves. 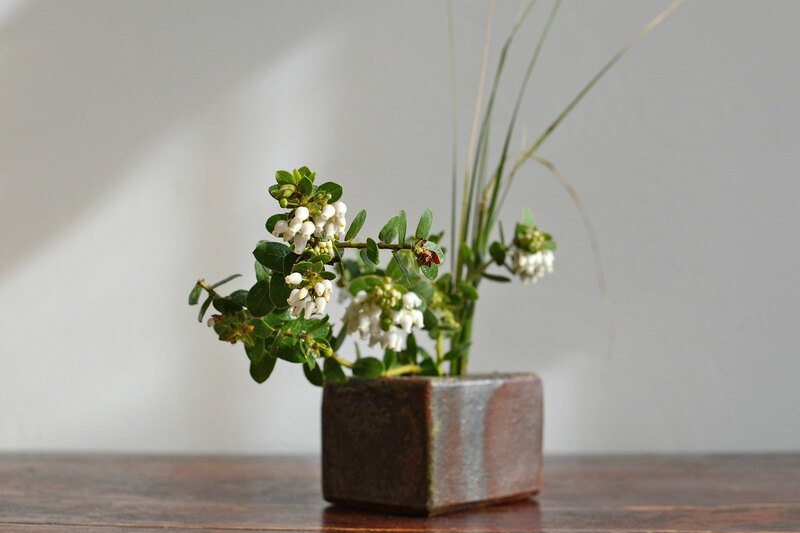 My desire for this flower was made stronger because of its perfect name, which includes the word wabi! 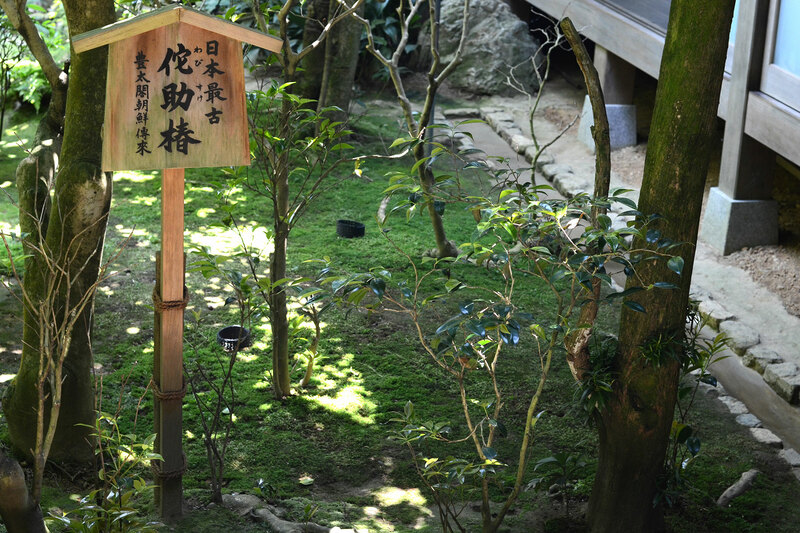 Japan’s oldest Wabisuke Camellia in Ryoanji temple Kyoto, conveniently labeled for tourists with a sign. Then, I looked at a photo that I took of Japan’s oldest Wabisuke plant in Ryoanji from a past trip to Kyoto, and realized that I was crazy. Camellias really belong where there is regular rain and sufficient humidity, which is usually where luscious mosses can grow and cover the ground. When I mentioned this to my tea teacher who has been growing tea flowers in San Diego for the last 50 years, she shook her head and confirmed that “camellias are the most difficult to grow and care for” in Southern California. Single form white camellia that will be close to impossible to grow in Southern California. White camellias are especially difficult to grow according to my tea teacher. 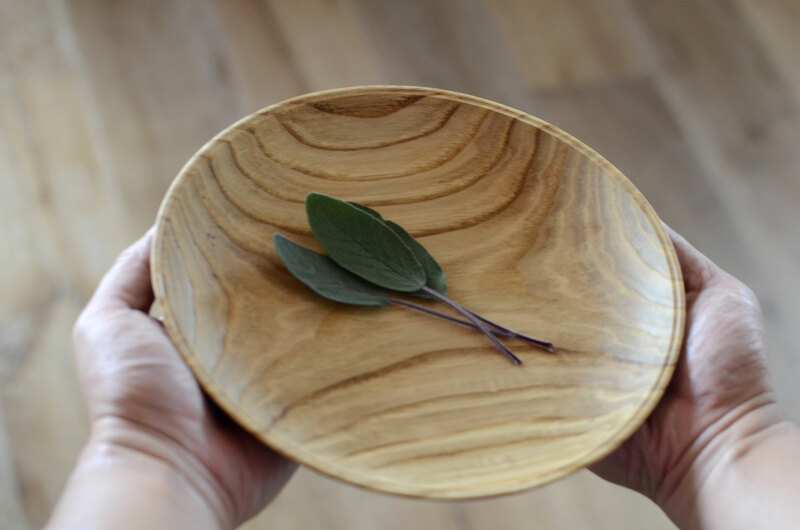 Feeling defeated before even planting a single flora, I looked through my tea ceremony guide book and re-read the seven rules of Sen no Rikyu, which led me to the opening question of this blog. After some research, I was surprised to discover that there are thousands of plant species in California, many of which can be found nowhere else. Many also bloom with beautiful and unostentatious flowers. I excitedly thought that I should try turning my back-garden dirt strip into a native flower cutting garden and started to investigate which plants I should grow. This was no easy task because the actual plants are not commonly sold in nearby nurseries. 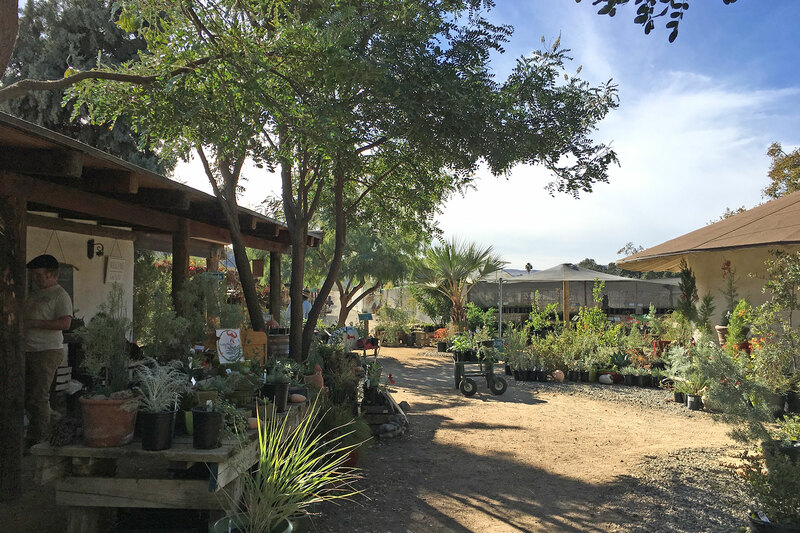 Finally when I attended a native garden workshop I discovered the Tree of Life nursery in San Juan Capistrano that is owned by Mike Evans. I was inspired when he said that “your garden should provide a sense of place and it should be a place where you want to spend time engaging and enjoy caring for”. Tree of Life specializes in native plants suited for Southern California and each plant is provided with a detailed description for the care that it needs, which is very helpful for a novice gardener like me. 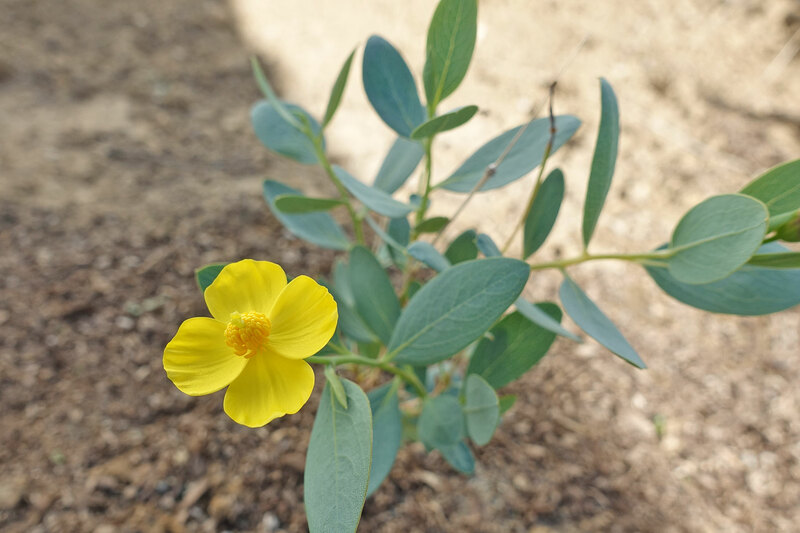 The first native flower I planted was an Island Bush Poppy. This should grow to over 5 feet. 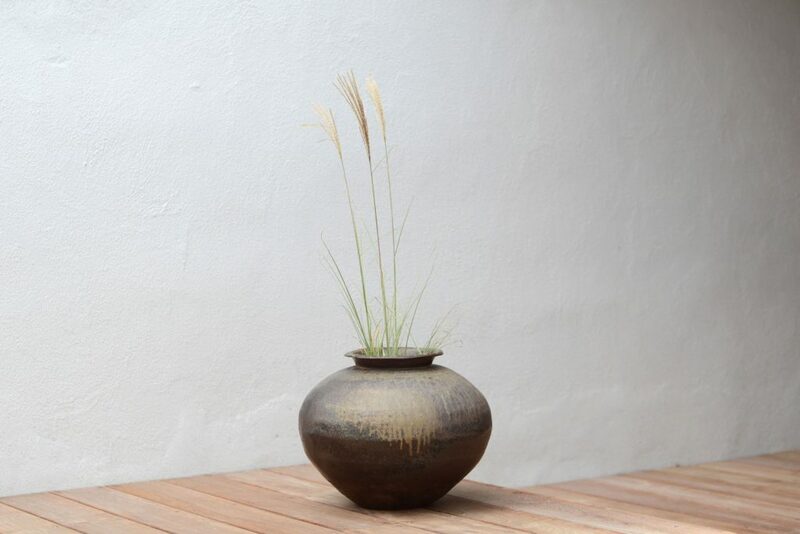 Manzanita Vandenberg with deer grass in Bill Geisinger’s wood-fired vase. Its flowers look like lovely upside down vases when looked at closely, its fruit look like mini apples (manzanita in Spanish). Today, I cut a stem from the Vandenberg and put it in a vase by Bill Geisinger, which is made from California native clay. I do not know what Master Rikyu would have thought about this arrangement, but it was a moment when I realized that the wisdom he had left behind over 400 years ago continues to be relevant as a guide for figuring out a good perspective, and a way of life. Above all, I am grateful that these plants provide a sense of connection to California, even for a transplant like me. 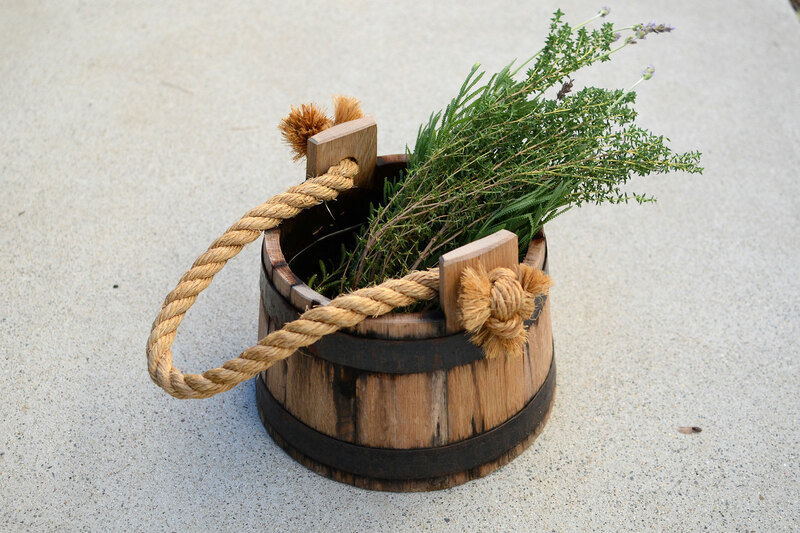 Until I saw the solid and tightly coopered sea service bucket by Marshall Scheetz of Jamestown Cooperage, I never gave much thought to how, even just 100 years ago, coopered wooden containers were essential for people in their daily lives. A sea service bucket by Marshall Scheetz. It is so called because it doesn’t tip over easily with the wide base. This bucket has been used outdoors for carrying water and other garden chores for over a year and is still completely watertight. “It is so interesting to look at 18th century illustrated encyclopedias. Almost every image in every chapter depicts people from all walks of life using barrels, tubs and buckets for their work”, Marshall points out. He is one of only half a dozen or so remaining master coopers in the U.S. with the ability to create and repair all kinds of cooperage using traditional tools. 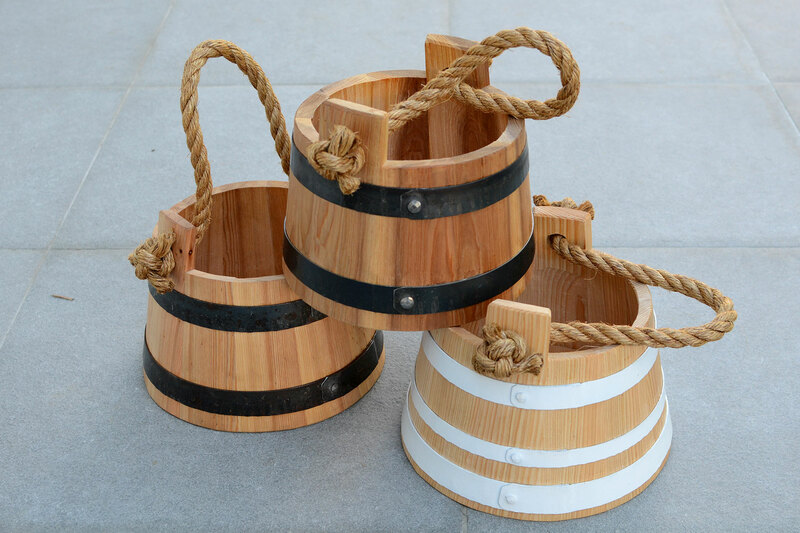 The types of work that Marshall makes include the most difficult watertight casks for carrying valuable liquid like wine to everyday vessels like tubs, buckets and tankards that have now mostly been replaced by plastic counterparts. Marshall Scheetz at a coopering demonstration in Saratoga in 2016. 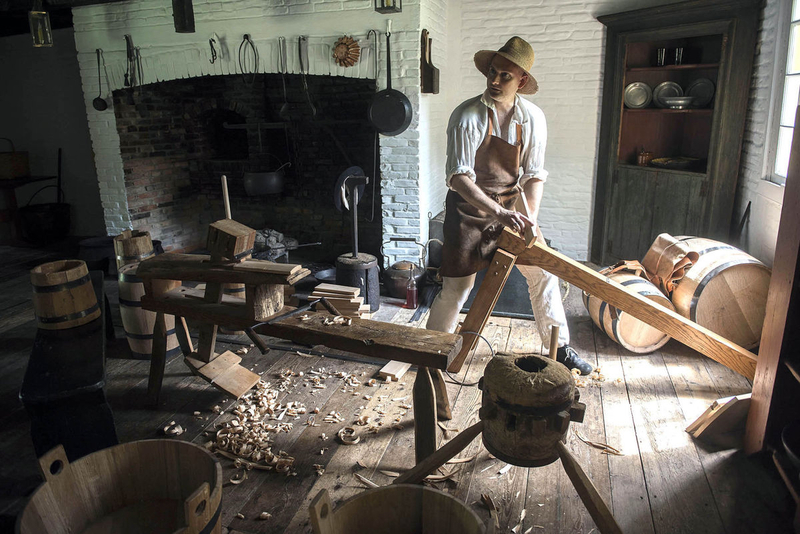 Marshall learned his coopering skills during a six-year apprenticeship under master cooper James Pettengell at the Colonial Williamsburg Foundation. Since 1971, only four people completed the apprenticeship under master coopers George and James Pettengell, who were brothers that moved from London to set up the cooper shop at Colonial Willamsburg. 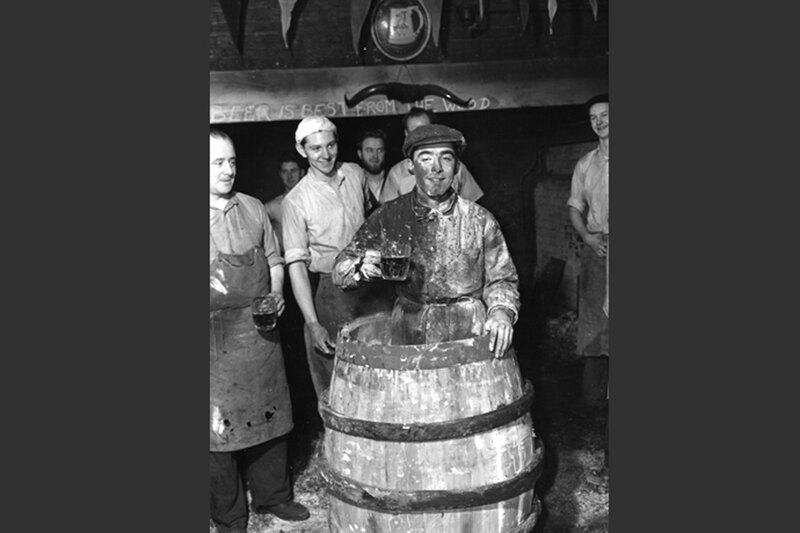 With a surge of renewed appreciation and demand for liqueurs like whiskeys, wines and beers aged in wood barrels, there are currently many coopers working in the U.S. I remember reading a few years ago about a barrel shortage in the booming bourbon industry, so the cooper’s trade, in the form of barrels, is thriving. 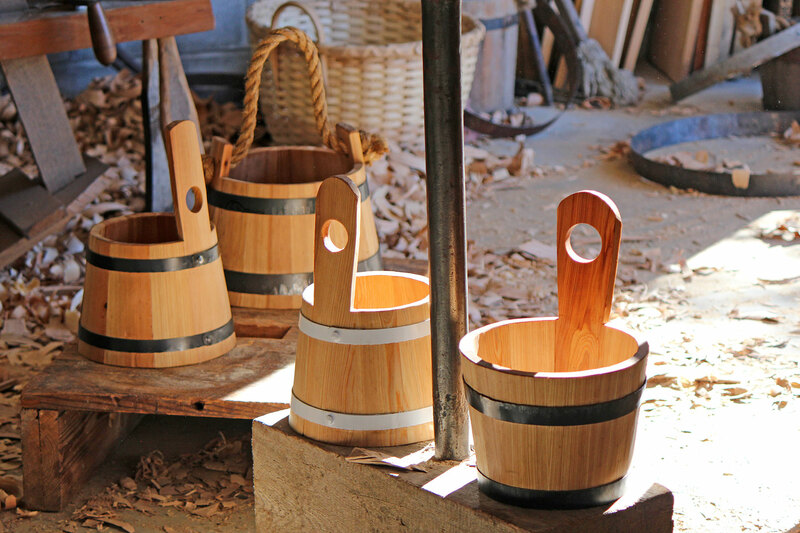 These industrial coopers assemble staves, drives hoops, and repair casks just as traditional coopers do, but Marshall is unique because while he can make and repair casks, he also creates smaller items like buckets, tankards and tubs that require an additional set of skills and tools. Piggins at the cooperage studio of Marshall Scheetz in Williamsburg, Virginia. While industrial coopers spend the majority of their time operating machinery, Marshall continues an ancient skill of cooperage using traditional tools taught by his master. As a scholar, teacher, and expert on cooperage history, it is important for Marshall to carry on what was taught to him. 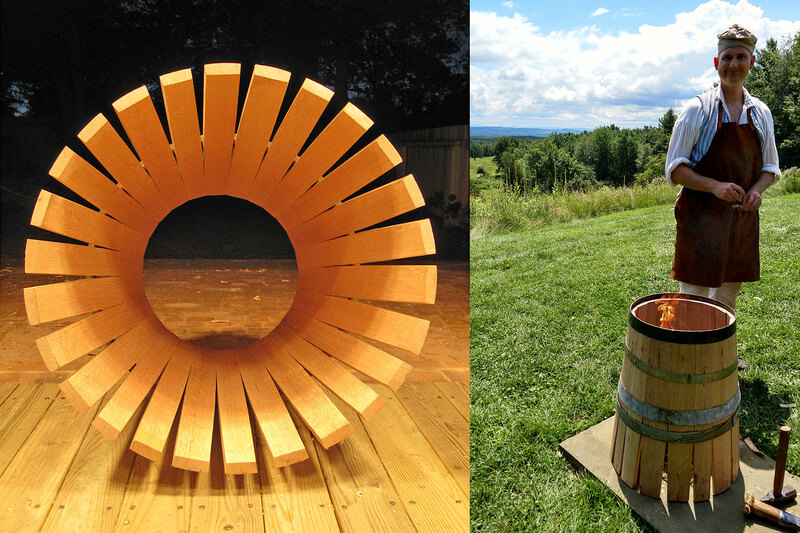 Left: A hogshead sized barrel (63 gallons) just before trussing (bending of the staves to make the barrel shape). Right: Marshall heating the barrel staves to soften the wood so they will bend when the truss hoops are hammered down onto the splayed end of the cask. The fire is contained inside a small metal basket called a cresset. To make a cask, Marshall uses about two dozen tools. 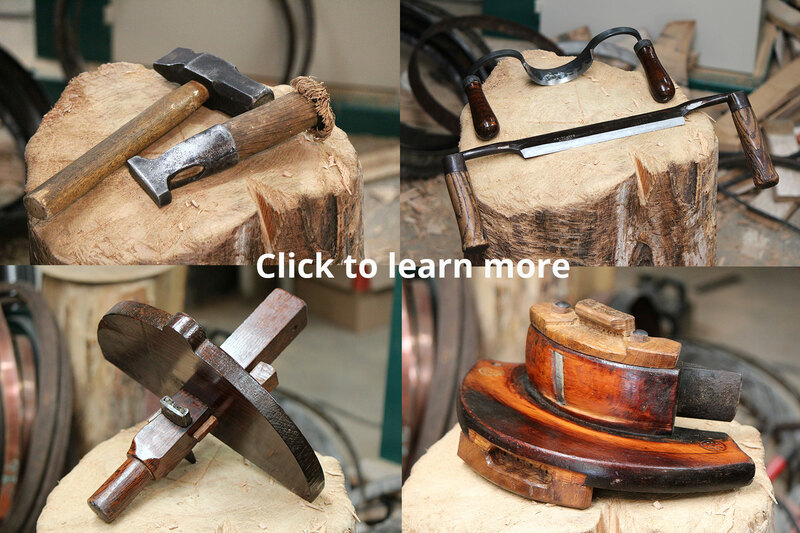 Most of the hand-tools that he uses are antiques from the 19th to early 20th centuries. They are oiled on a daily to weekly basis and grounded or sharpened only as needed on a traditional whet stone wheel with water. 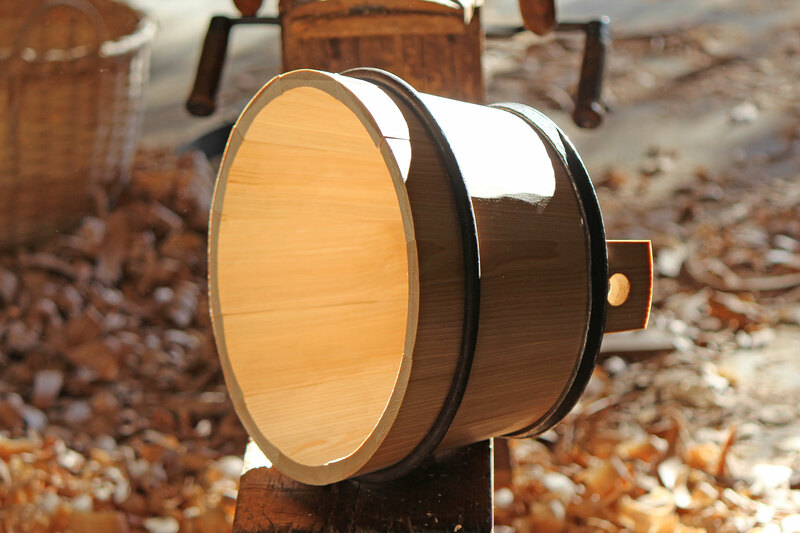 Marshall occasionally prepares raw materials from trees, but mostly, he uses quarter-sawn timber from mills so that he can focus his time on honing his coopering skills. Manually shaping the wood for staves and other parts of the coopered vessel require cognitive skills that are more like sculpting than woodworking. To create a watertight vessel, he measures subtle details by touching the stave and scanning for corrections, and makes them liquid tight simply by the fit of the pieces. The resulting buckets, tubs and everyday containers are high-quality functional items and they carry the intrinsic beauty of the hand and its work. Marshall jokes that “hand-making products by yourself in the modern capitalistic society can be economic suicide”. 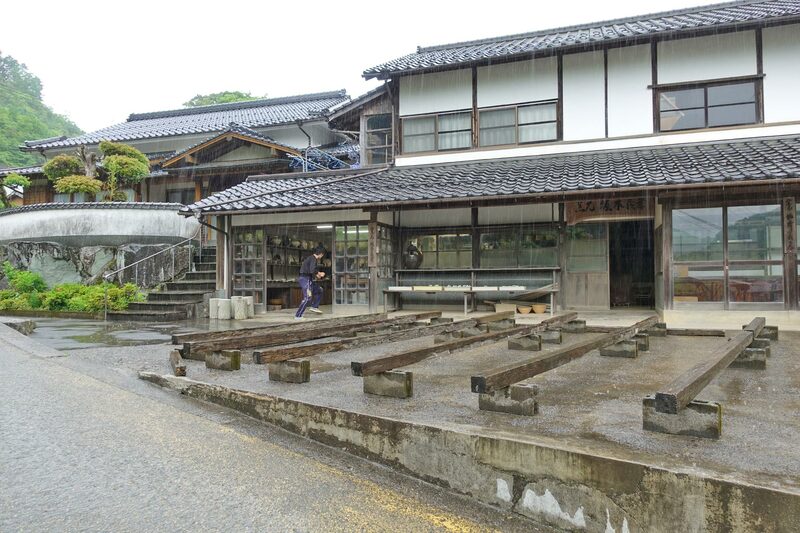 But Marshall thinks of himself as a keeper of the cultural heritage of an ancient skill, which means that he is constantly researching about cooperage history. Some of the topics that he is currently studying include looking at the production points of Hagley Gunpowder Mills, the whaling industry of New England, and cooperage made by the Shakers in the late 18th and 19th centuries. 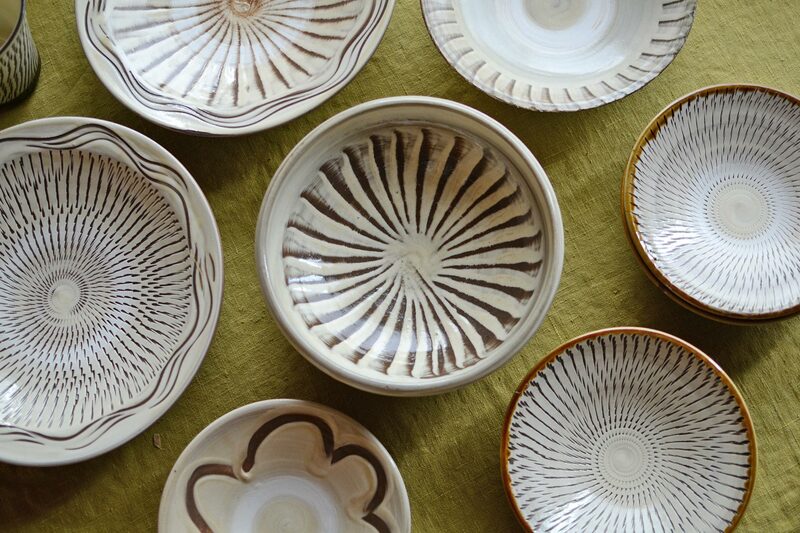 Do you use spouted bowls on your dining table? If not, I highly recommend that you do. Don’t be misled by the spout though as these bowls are not just for pouring liquid, but are also great for serving a meal, soup, or even displaying flowers. The best way to think of them is that they are a bowl with a “mouth” that has personality and charm. 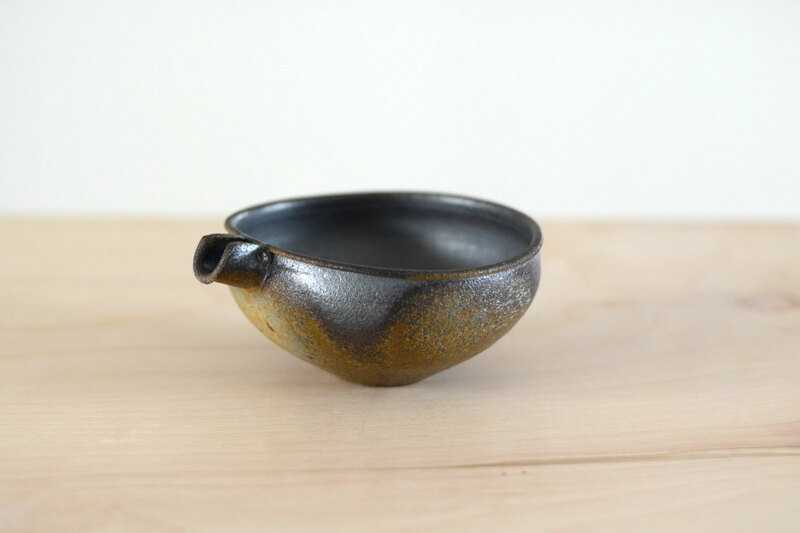 In Japanese, these vessels are called Katakuchi, and there is so much interest and obsession with them that there are stores that specialize in only selling spouted bowls. Kazu Oba’s white katakuchi with a touch of blue from the salt introduced to the kiln at the last stage of firing. As my regular customers might already know, katakuchi are my favorite types of vessels and I can’t seem to get enough of them. 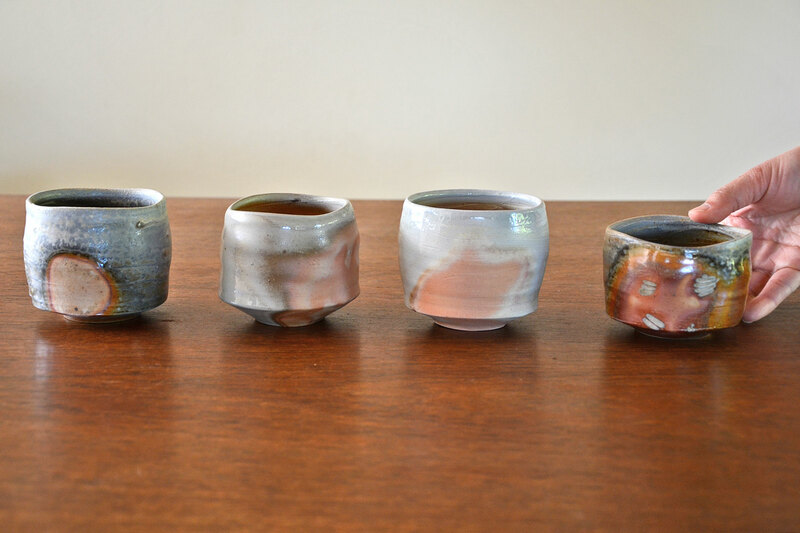 Luckily, I just received a whole bunch of them from Kazu Oba in Colorado, together with other beautiful pots by him. Please enjoy browsing these gorgeous mouthed vessels in my shop today! 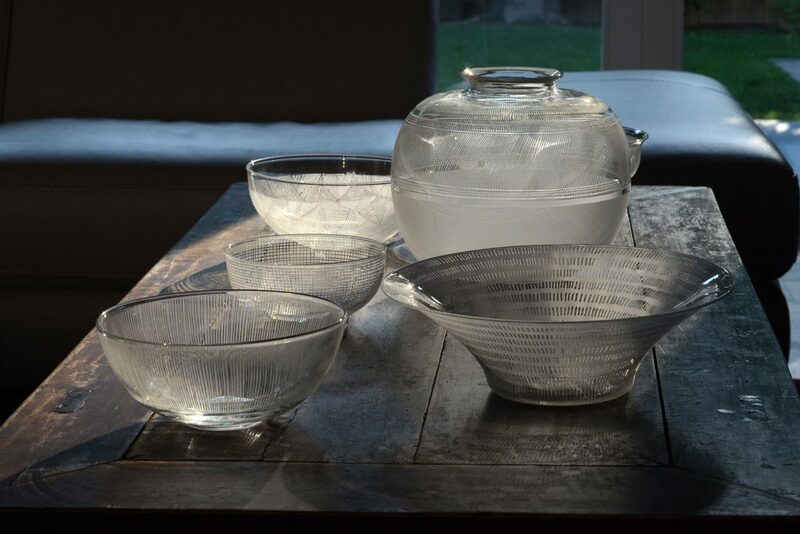 I am really excited to be able to show over 100 masterful pieces of work by Japanese glass artist Nitta Yoshiko at the Mingei International Museum Shop in San Diego this weekend. I have known Yoshiko for over 5 years now, and I still remember vividly when I first saw her glassware at a craft fair in Osaka in 2012. 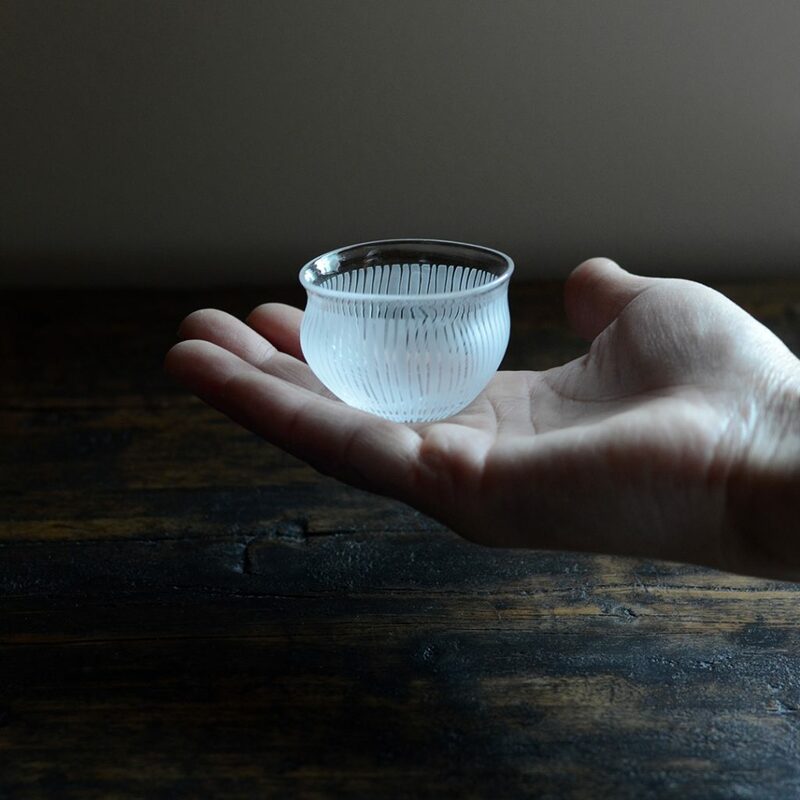 I had never seen blown glass as thin and comfortable to hold as those made by Yoshiko, and I excitedly asked if she was willing to work with me to introduce her work in the United States. I was so happy when she agreed! Almost every day, I use the glasses that I first bought from her back in 2012. 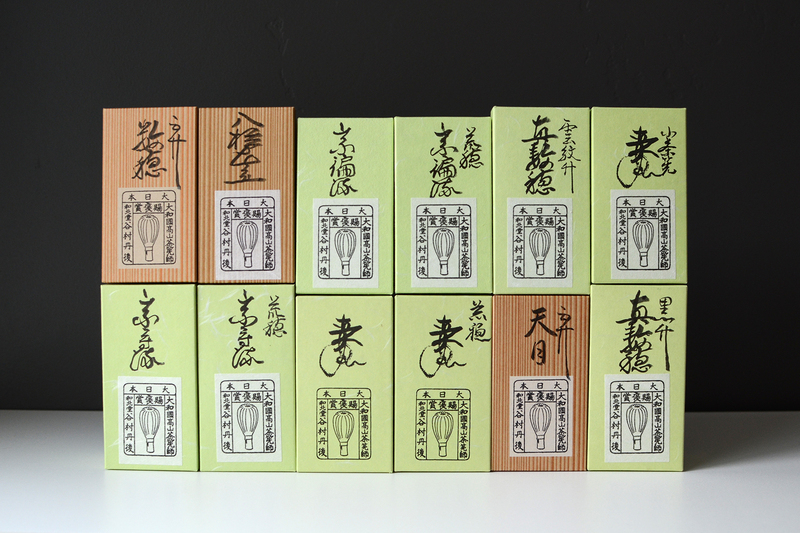 Yoshiko’s works are not just beautiful and simple, but also very sturdy. Yoshiko makes her work exclusively with clear glass that demands the highest skill from the glass blower because any unevenness in the thickness can be obvious at first glance. 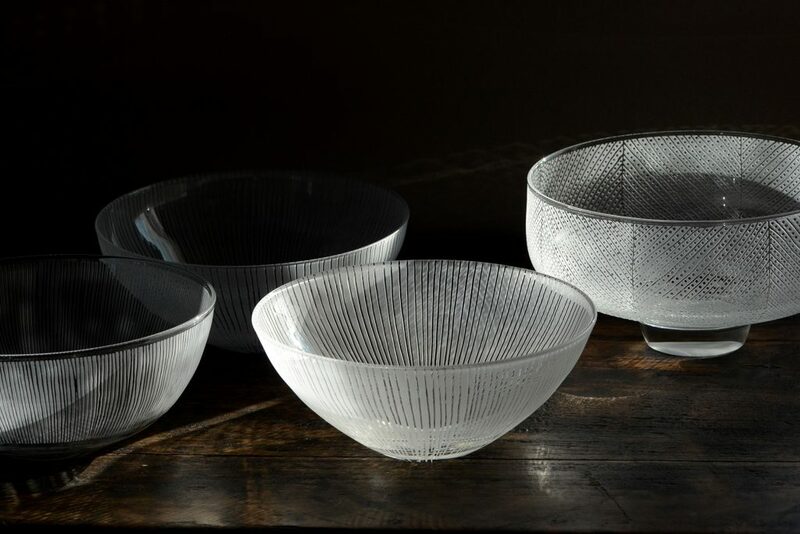 Nitta Yoshiko chose to work with clear glass because she thinks that the most appealing aspect of glass is its ability to let the light through, and its shadow to fall onto the surface that it is placed on. 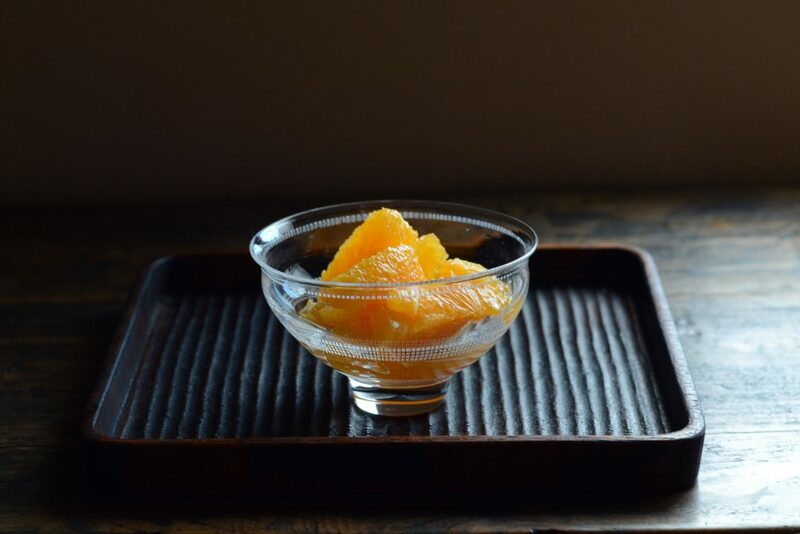 Orange supreme in Nitta Yoshiko’s footed bowl. 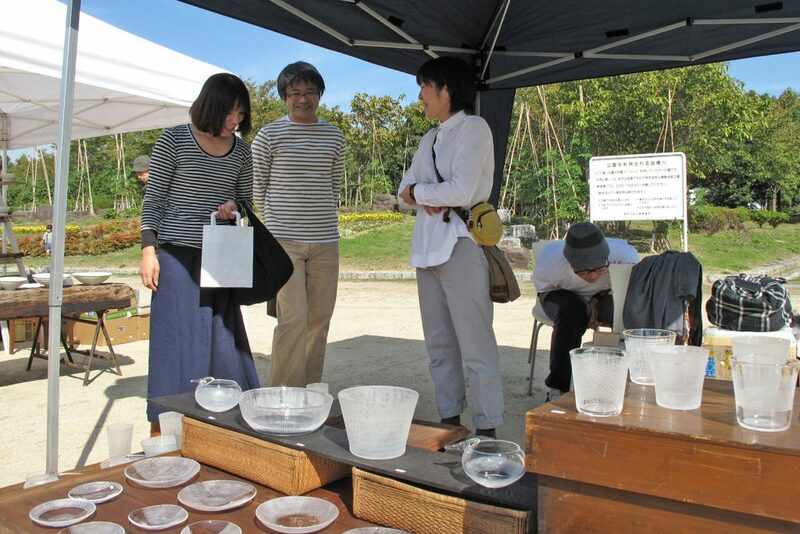 Yoshiko works with clear glass because it shows the true colors of the objects that it is holding. 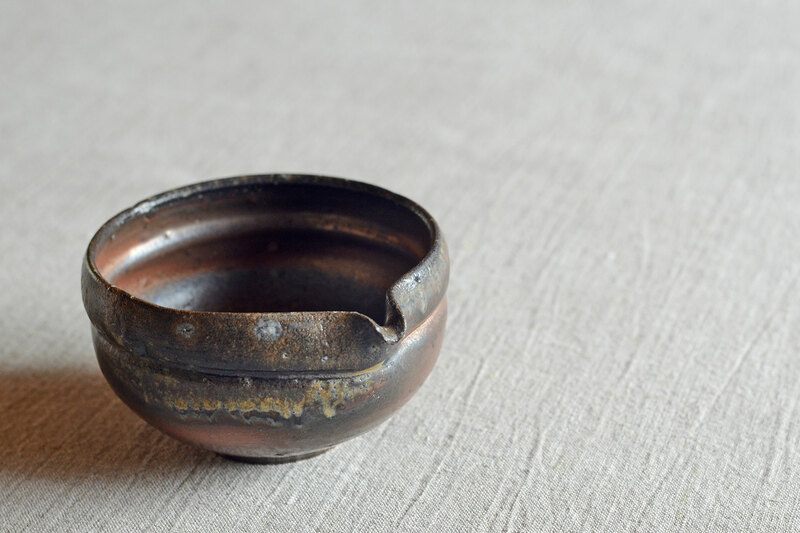 The maker’s regard for the end user can be felt in every piece that is made by Nitta Yoshiko. Yoshiko was planning to be in San Diego for this show but a family emergency made that trip impossible unfortunately. Nonetheless, she is here in spirit, and her regard for you, the end user, can be felt in every piece that she made and sent. I hope that you will be able join me in celebrating her beautiful work at the most fantastic and appropriate venue that is the Mingei International Museum Shop in San Diego. These trees often have significant meaning for the homeowners because their ancestors may have planted them or they may have played on them when they were children. 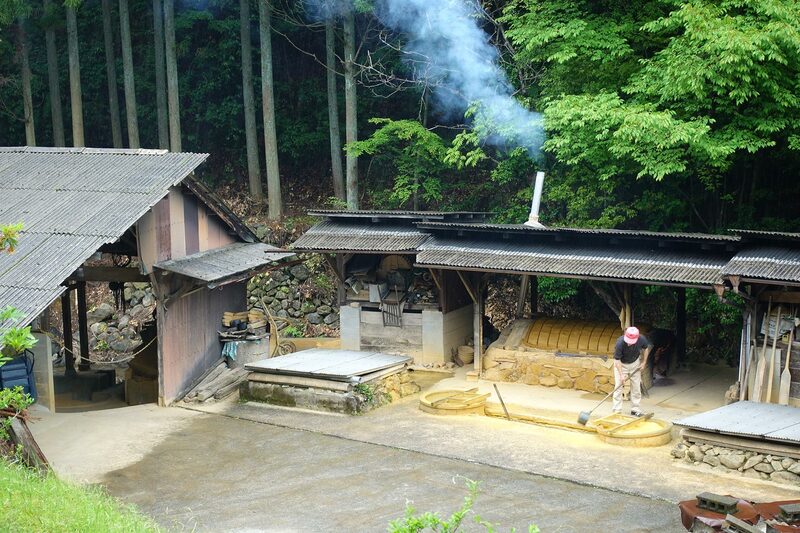 Nakaya-san feels that by making vessels out of this wood, he is ensuring that the legacy of these trees live on. Nakaya-san’s wood vessels are shaped before the wood is completely dry and allowed to shrink and warp to provide their distinctive curves. The foot is created after the wood is thoroughly dried to make a leveled bottom. By creating vessels in this way, Nakaya-san thinks that he is letting the wood to speak, and decide the shape that it wants to be. Looking back, I realize there were so many things that I disliked eating when I was a child. 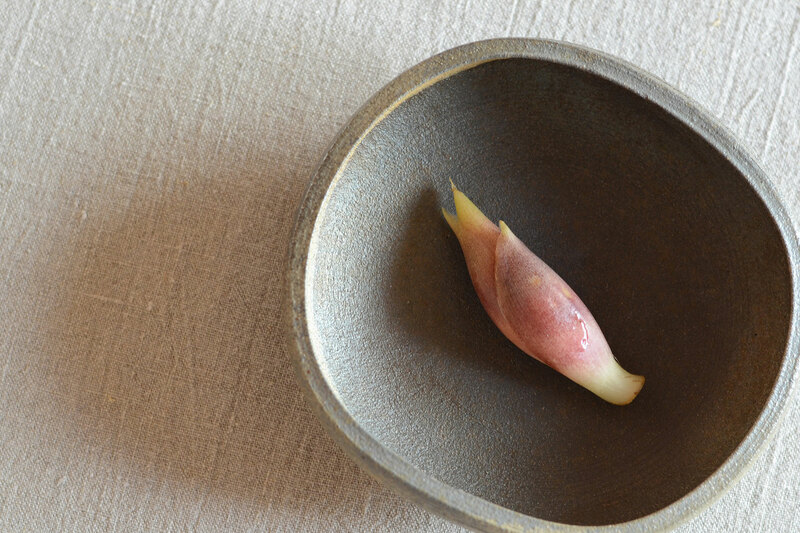 One of my arch enemies was myoga, the flower buds of Japanese ginger that appeared regularly at the dinner table in the summer and did not go away until October. Just like green onions, myoga was served as a garnish in miso soup, cold tofu, and other delicious things that, to a child’s tongue, tasted far better without this cursed topping. These terrible condiments are called yakumi, which means medicinal garnish, and my dream was to move to a world where they served food without them. The other problem with myoga was that it was also the motif of my family’s crest. When I discovered this fact, I was so disappointed that I wasn’t born into a family with beautiful flower crests like Wisteria or Paulownia. I mean, why a lowly vegetable? 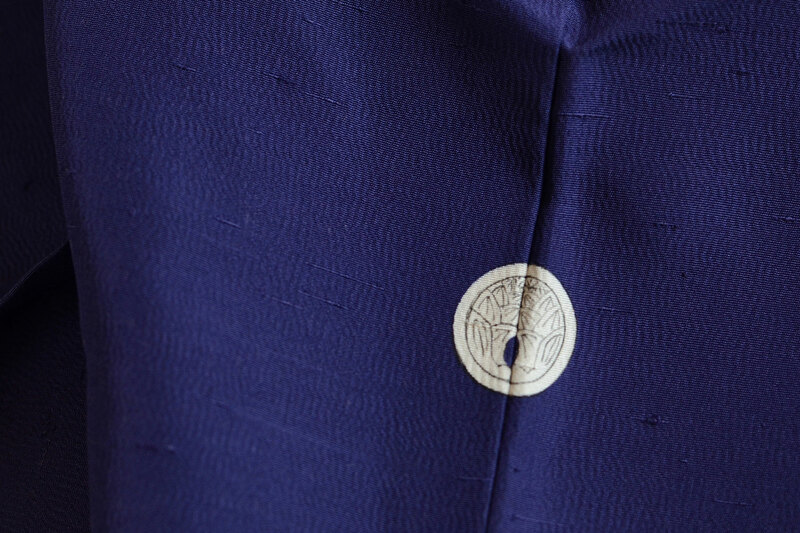 Family crest on my kimono, daki-myoga. 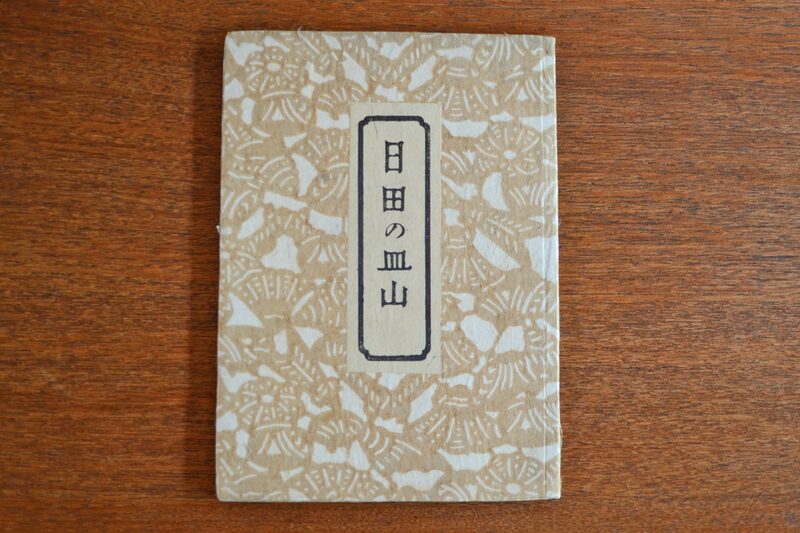 The Japanese ginger motif. 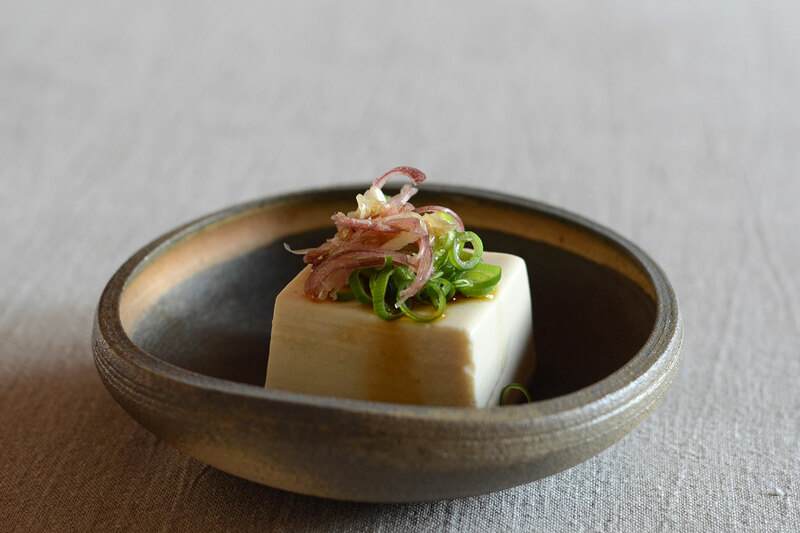 Years have passed and now a cold tofu without yakumi would be a let-down at the dinner table. And I even rather like the fact that a hardy shade-loving Zingiber is the motif of my family’s crest. 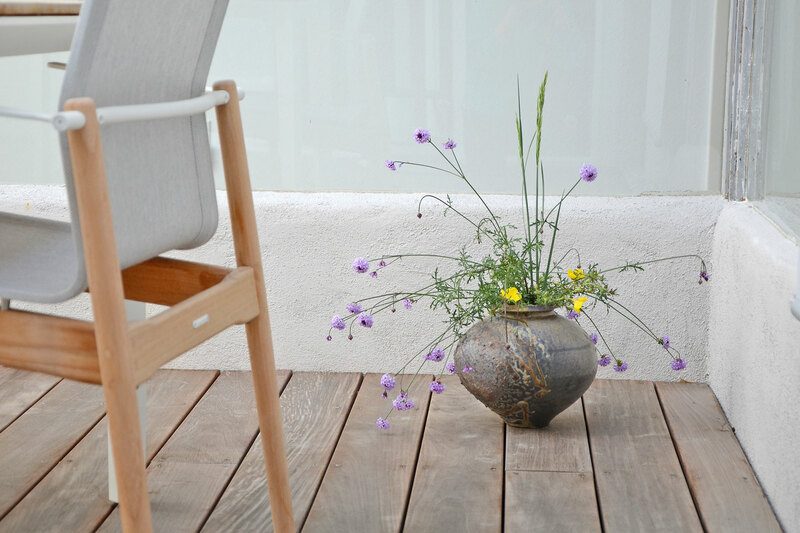 Ceramics fired with wood and adorned with their natural ash are one of the most fascinating types of pottery to bring into our daily lives. This is because the color and texture varies throughout each vessel, and new things can be discovered as the user explores the surface while handling the vessel. A wood-fired spouted bowl by Samuel Johnson. 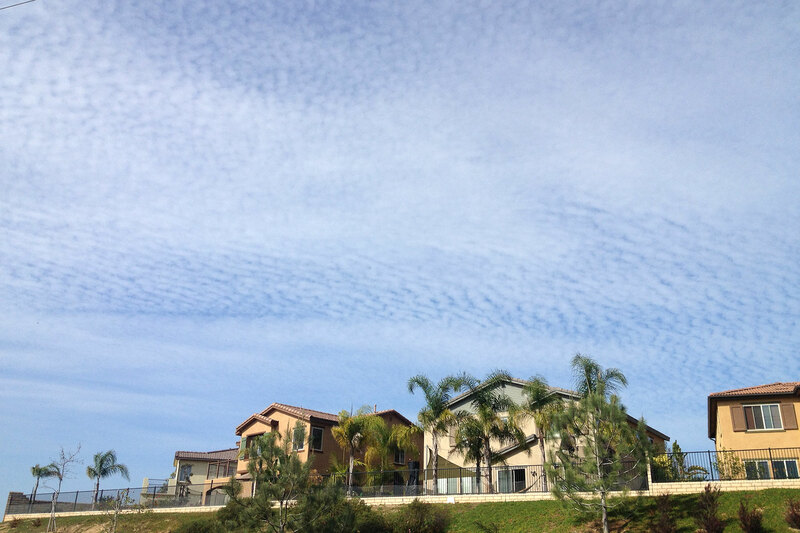 The user will notice the various colors and textures revealed in different lighting conditions. When Samuel Johnson was inspired to become a potter as a junior at the University of Minnesota over twenty years ago, he says that he fell in love with the concept of “expressing complex ideas and feelings through a limited structure, and was overwhelmed by the creative potential others had found within it”. 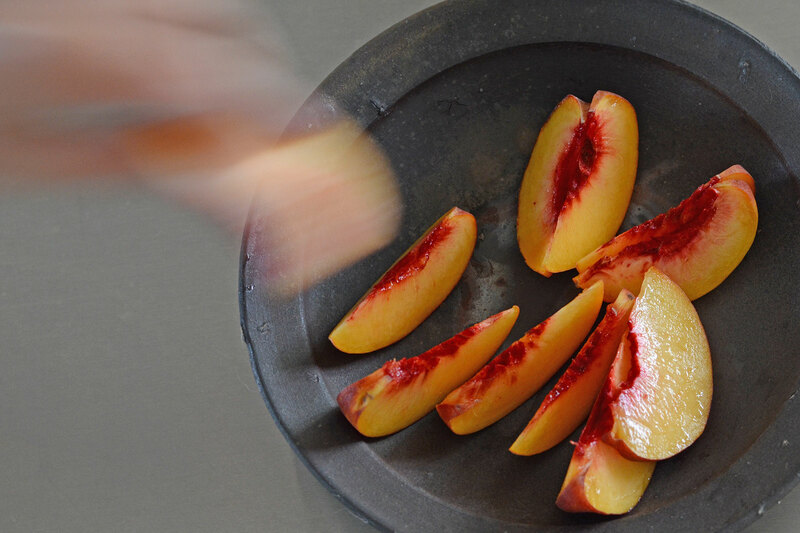 The dark clay body of Samuel Johnson’s work brings out the beautiful natural colors of fruit, like these peaches. Samuel’s work is robust and with a strong feeling of tradition. His creations are simple and powerful, undisturbed by modern motivation. He says his skill and sensibilities were most influenced by his teacher and mentor Richard Bresnahan, whom he apprenticed under for over three years right after graduating from college. 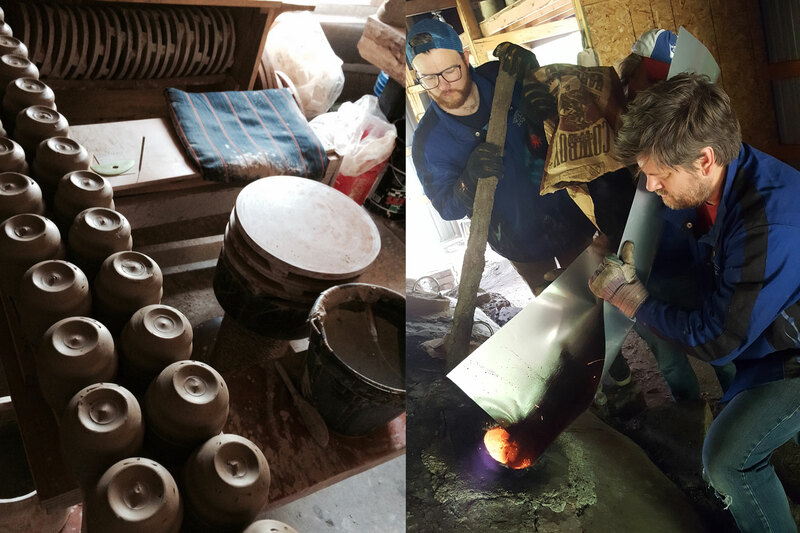 Bresnahan has been the Artist-in-Residence at The Saint John’s Pottery for over 35 years and is renowned for his unique aesthetic and tradition of deriving materials for making pottery from indigenous materials. 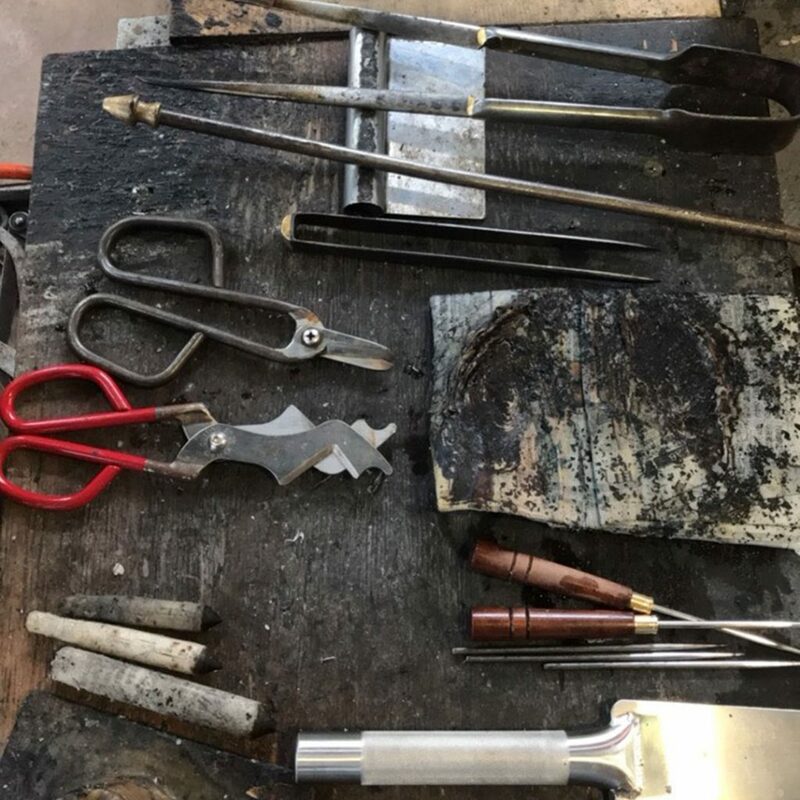 “I learned my fundamental skills in his studio and developed my sensibilities for both the how and why of it”, Samuel recalls about his time as an apprentice. Samuel is also deeply influenced by the work of Nakazato Takashi, a 13th generation potter in Karatsu, Japan who was the teacher of Bresnahan. Nakazato is one of Japan’s most revered contemporary potters who has helped bridge countless interactions and exchanges between potters of Japan and the U.S. His achievements also include the revival of the powerful Yokino ware, an indigenous and beautiful wood-fired, simple unglazed type of pottery from Tanegashima Island. A paddled jar by Samuel Johnson. The stunning form is a reference to the Karatsu tradition of pottery where Samuel’s teacher Richard Bresnahan studied as an apprentice. It is important to Samuel that his work represents a lineage and connection to a tradition. “Having studied within a specific lineage of makers, I feel responsible to them and their aesthetic tradition. Yet, theirs is a tradition of diversity”, says Samuel to explain how his teachers have influenced his work. He also sometimes deliberately makes forms that reference their work, as a mark for the insightful to notice. Samuel today is an Associate Professor of Art at the College of Saint Benedict and Saint John’s University. As a full-time professor and father of four young children, his pottery work is undertaken mostly at night after the children have gone to sleep. 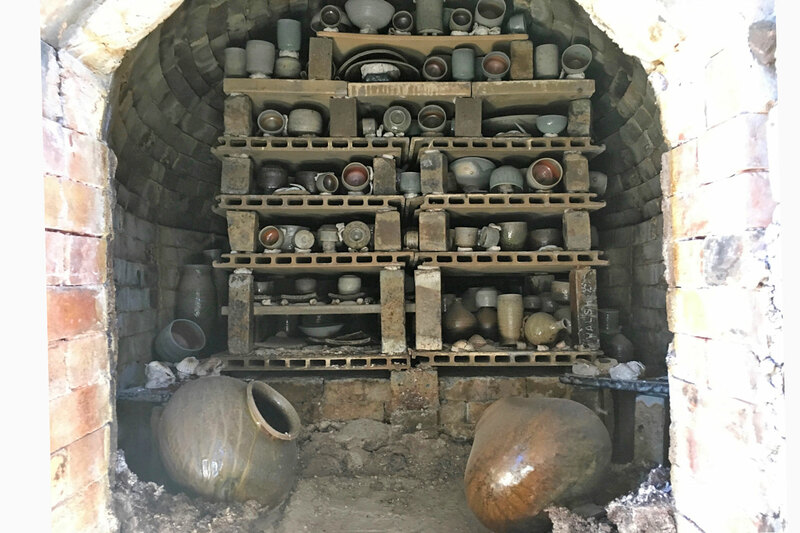 Work must be stocked up over several months to fill a wood kiln that he built on the university campus. 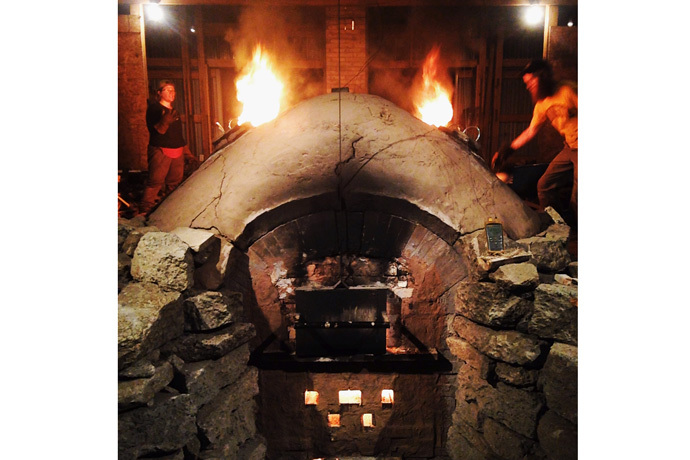 The firing of the kiln is an event involving students and members of the local community that happens two or three times a year. 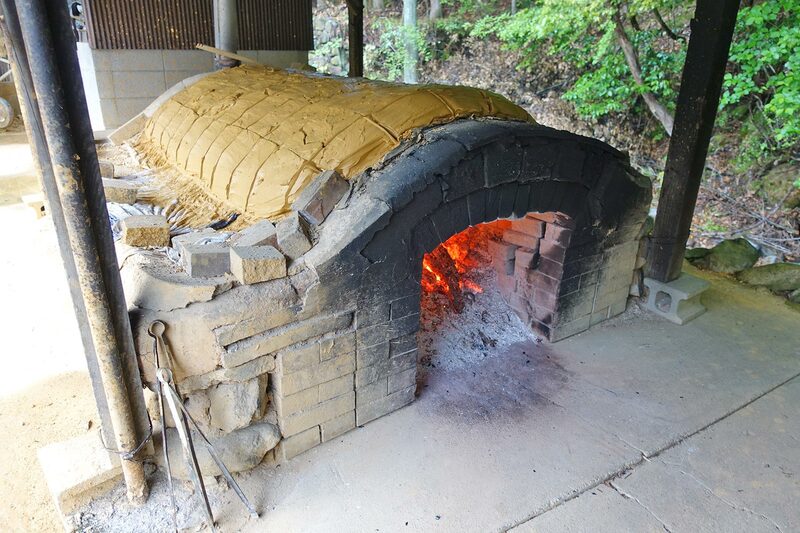 In addition, Samuel fires his gas kiln several times a year in-between the wood kiln firings. 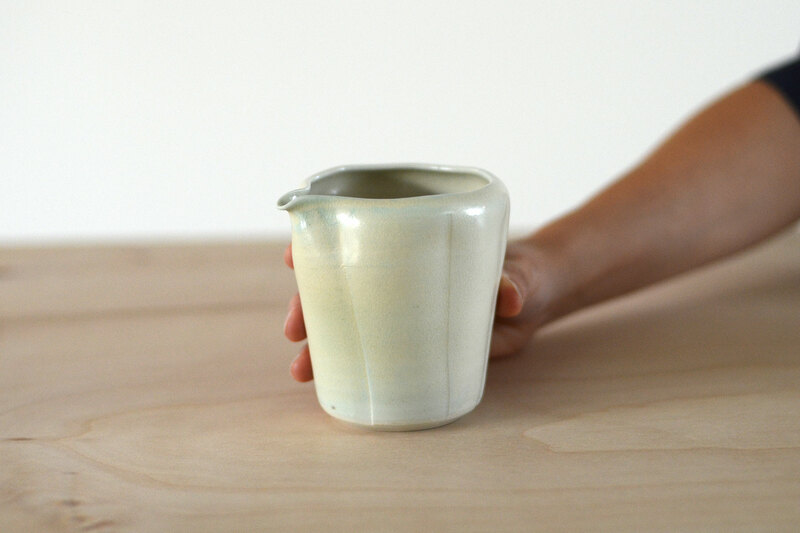 “I like pots that feel enigmatic, mysterious, and resolute”, Samuel says. 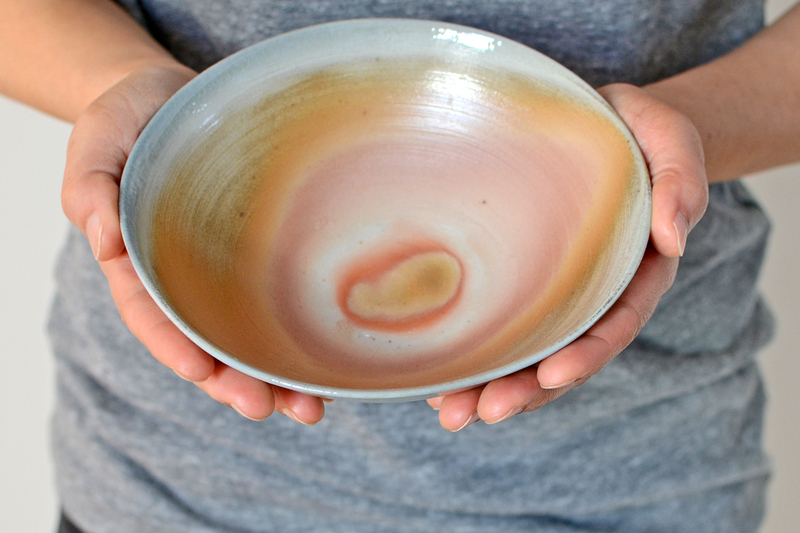 He also considers the functionality of pottery as essential, because it is a unique form of engagement that is largely absent in other art forms. So I invite you to take a closer look at Samuel’s work and experience the emotions that they can evoke. By pouring tea in his cup, serving salad in his bowl, or putting a flower in his vase, you may experience the feeling of encountering an old tree, the tenaciousness of a rock, or the seasons and passage of time. It is like visiting a wonderful garden, right inside your hands.